Towers Falling has been on my TBR for quite awhile now, and my OverDrive hold came in right before Sept. 11. Perfect timing! I didn't love or hate this one; it has lots going for it and loads of discussion potential. SUMMARY: Ten-year old Deja has just moved into a homeless shelter with her parents and her younger brother and sister. She's also starting a new school, a better school than the one she previously attended. But when her teacher starts talking about the events of September 11, 2001, it seems Deja is the only person in her class who knows nothing about it. Why have her parents sheltered her from this knowledge, and why does Deja's father get so upset whenever she brings it up? REVIEW: Oh, the mixed feelings I have about this book! Overall, I think this is a very needed title to have in school and public libraries. It isn't easy to explain the horror and significance of 9-11 to someone who wasn't even alive at that time. I know the JFK assassination does not have nearly the impact on me as it did on my parents. And Pearl Harbor was a huge event for my grandparents. But even though I have visited Pearl Harbor personally, it doesn't affect me in nearly the same way as 9-11 or even the Challenger explosion in 1986. 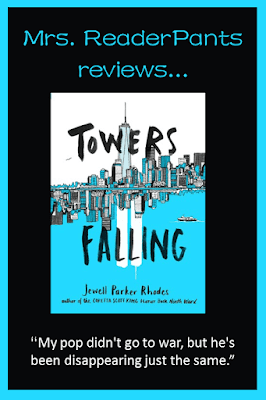 So, yes, Towers Falling is a much-needed addition to libraries, and I see lots of ways teachers could use this book in their classrooms. The detailed way Deja imagines the plane impact and the collapse of the buildings is perfect. It's not overly-graphic, but it will help young readers really think about the horror and fear and confusion of that day. Well done! I also appreciate Deja's father's PTSD and survivor's guilt. PTSD is something some children deal with at home but likely do not understand--super-important to include in today's literature for young people. That Deja's family is homeless is also a nice addition. So what's not to like? Well...I just didn't find the story all that interesting. I skimmed some parts and daydreamed a bit in others. Deja and her friends are cute, but they are all so nice to each other. They are also smart, really into school, and creative. And that's everyone in the class. Where are the bullies? The nay-sayers? The n'er-do-wells? Does the teacher Miss Garcia ever get upset with her class or have a bad day? As a 17-year veteran of education, I can assure you that no class runs this smoothly all the time. It also felt a little...preachy? I'm not sure if that's really the right word, but the reader is truly beat-over-the-head with the patriotism and American-ness of the story. As someone who has lived outside the USA for the past few years, I notice this much more prominently than I would have before I moved overseas. Even though the story does mention some Americans' hatred towards Muslims, it's pretty idealistic about America's acceptance of immigrants. The comments section of any Yahoo article about immigration will tell a very different story about how accepted immigrants are in the USA. Examining Towers Falling through the lens of today's political climate in America could be an interesting endeavor for older students. THE BOTTOM LINE: A must-purchase for all libraries serving ages 9+. Deja and her friends are only fifth graders, but I would love to teach this book with a seventh or eighth grade reading group--so many juicy discussions could come from it! Don't let the young age of the characters put you off. STATUS IN MY LIBRARY: On-order and expected any day!